Greek rice pilaf or pilafi (πιλάφι) is a dish which consists of rice cooked in broth. For the basic Greek rice pilaf recipe, the rice is first sautéed in butter for extra flavour and then cooked in meat or vegetable stock and usually finished off with lemon juice (Greek rice pilaf with lemon). If you have Greek origins then it’s more than possible to have been offered this as a child to cure all aches and illness! For extra flavour Greek rice pilaf can be cooked with bits of onions and spices or Saffron (Krokos kozanis). This basic recipe is a great accompaniment for meat dishes, like souvlaki, gyros or biftekia. Depending on local cuisine this classic Greek rice pilaf recipe may also contain vegetables, like sliced carrots, peas, corn etc. One very popular variation is gamopilafo, a festive Cretan specialty offered at weddings (gamoi), where the rice is cooked in lamb broth. Simply delicious! For an everyday super-filling meal try preparing this Greek rice pilaf recipe with chicken thighs or pieces of chicken breasts. Garnish with crumbled salty feta cheese and enjoy! 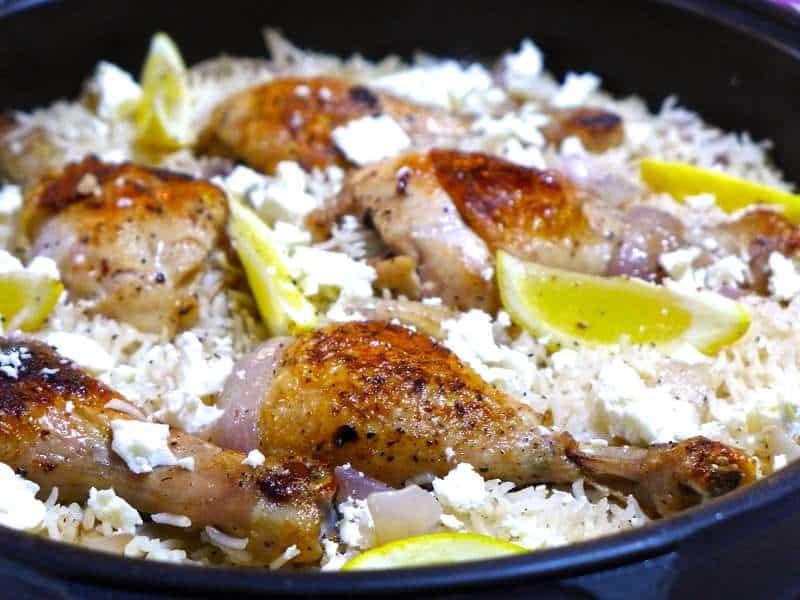 To prepare this Greek rice pilaf recipe with chicken thighs, start by washing thoroughly the chicken thighs and pat them dry with some kitchen paper. Drizzle the chicken thighs with olive oil, season well with salt and pepper and rub using your hands. Heat a large pan over medium high heat and place the chicken thighs inside. Let them colour and cook for about 6 minutes on each side, until the skin is nicely coloured and crispy. Remove the chicken thighs from the pan and set side. Now it’s time to prepare the Greek rice pilaf. In the same pan add 1-2 tbsps olive oil and the chopped onions and sauté until soft. Add the butter and rice and sauté the rice until transculent. Pour in the chicken stock and lemon juice and deglaze. Add the chicken thighs (skin side up) and season well with salt and pepper. Place the lid on, turn the heat down and simmer the Greek rice pilaf for about 15 minutes, until the chicken and rice are cooked and all the liquid has been absorbed. Finish off the Greek rice pilaf with a last minute squeeze of lemon juice, crumbled feta cheese and freshly ground pepper. Enjoy!